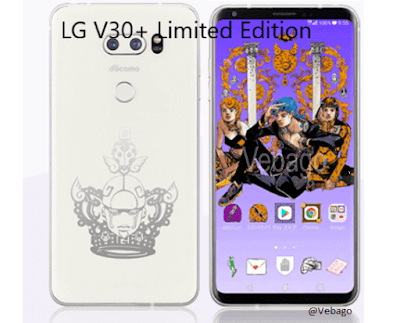 The Korean company LG has introduced the Limited Edition of LG V30+ JoJo’s Bizarre Adventure smartphone in Japan. The Special Edition LG V30 Plus has similar specs with the standard LG V30 Plus variant, but comes with a smaller battery which is powered by a 3060mAh. In comparison, the standard variant of LG V30 Plus comes with a 3300mAh battery. The device has an IP68 certification which makes it waterproof and dust-resistant. There is a 16MP +13MP dual rear camera setup, while on the front side there is a 5 MP selfie snapper. The smartphone comes with a 6-inch display and is powered by an octa-core Snapdragon 835 processor. The device comes with a 4GB of RAM and 128GB of internal storage which can be expandable using a microSD card. The phone will have model number JOJO L-02K and NTT Docomo will only issue 10,000 units of the LG V30 Plus Limited Edition.